Move over Kardashians, The Wus could be the next "it" reality TV family. We're talking about Bruneian actor Wu Chun and his photogenic family. Admit it, you've googled and ogled at Daddy Wu. We mean Wu Chun's suave father, Wu Jingtian who turned up in ripped jeans, shades and biker jackets on Chinese variety show The Best Times. At 72-year-old, the senior Wu's chiselled features and lean physique could rival any mature, leading men. We cooed over Wu's adorable kids, Nei Nei and Max, on Where Are We Going Dad?, a popular parenting TV programme in China. Netizens scoured the internet for clues of low-profile Mrs Wu, who appeared on the same show wearing a mask. She's a beauty, as seen in a couple shot Wu Chun uploaded online on Valentine's Day this year. Imagine the entire clan appearing together on the same screen. Wu Chun isn't ruling out the possibility of a Wu reality show, à la Kardashian style. "Sure, why not? I would consider the opportunity if it comes along. As long as it doesn't affect my children and their studies; my kids' welfare is my utmost priority," says the 39-year-old, who debuted as part of Mandopop boyband Fahrenheit. Wu Chun left the quartet in 2011, focusing on an acting career. We wouldn't be surprised if Senior Wu is already prepping for his next big appearance. 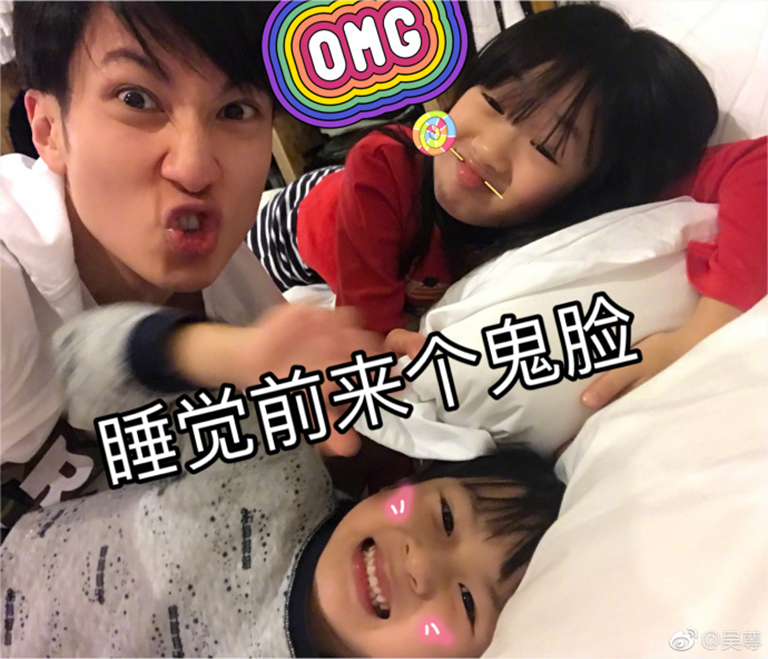 Wu Chun revealed his father gamely took on the offer to appear on The Best Times, a Chinese reality series featuring celebrities and their parents. "When you live till your 70s, you'd probably want to try things you've yet to experience. He enjoyed himself on the show, I'm sure my dad will be open to other TV appearances," says the singer-actor, who was in Singapore to open the Mark Nason x Skechers concept store in Bugis Junction. Mark is an American footwear designer. With father and son looking like the spokesman for miracle anti-ageing products, the secret we're all dying to know is where's the fountain of youth in Brunei. "There's no secret," he says. "We both love to exercise. I was influenced by my dad who likes to gym and play basketball. My father is an optimist, has a positive outlook in life [and that] helps you look young." Looking like a sprightly chap isn't just about striking the genetic lottery. You've got to dress the part too. Senior Wu is blessed with an innate fashion sense, which he imparted to junior. "I took an interest in fashion because of my dad. We used to go shopping together, he would give me fashion advice," Wu Chun says. We both have our own sense of style. He follows trends, whereas I'm into the casual, sporty look." What's Wu Chun's must-have fashion item? Sneakers, he says. "I love white sneakers. They get dirty easily, so I have a few pairs. Sneakers are really comfortable. I go everywhere in them. "My friends wear leather loafers or boots for vanity sake when travelling. Then they complain that their feet hurt. I tell them, 'See, I told you sneakers are comfortable.'" And this inclination towards comfortable fashion might have been inherited by his daughter, Nei Nei. The eight-year-old isn't into dressing up in puffy, tutu skirts. He says: "There are times where Nei Nei rejects the clothes I buy for her. She doesn't like pretty dresses, which aren't too comfortable to wear. Like me, she also likes comfortable clothes."